Before we talk about the 4th or 5th dimension, first some thoughts about the 2nd and 3rd dimension and the difference between these two, because that is an area that we can still imagine. Until the end of the middle ages, mankind believed that we live on a disc. That would a two-dimensional habitat, perhaps somewhat curved with mountains and valleys, with distortions in the third dimension. Let us imagine now a world, which consists of only two dimensions, length and width. That would be for example a picture or a television screen, a focusing screen, LCD display, a sheet of paper. We could move back and forth figures on it, left and right, which would be the first dimension, up and down, that would be the second dimension. Now that would be a pure surface. As children we liked to watch cartoon films, where Tom and Jerry or Janosch or other characters did move. That would be an image of our real three-dimensional world, but it would be a simplified world that lacks dimension. If we would live only in a two-dimensional world, then we would have no mass, no weight, no material from which forms can arise, no forms, but only surfaces. Let us take a sheet of paper, which is a 2-dimensional world, and paint 2 stick figure (image: blue and green) that are 2-dimensional beings. They can see each other, but they can not perceive the pen and us, because this is 3-dimensional and they are made only for the 2nd dimension. They are, for example, 50 cm apart from each other and they know that they have to travel this distance to meet. 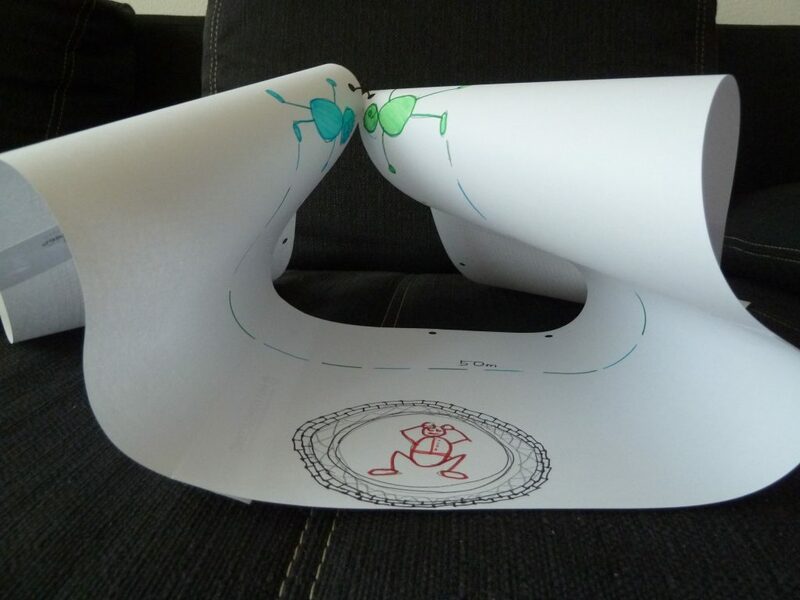 Let us fold the paper in waves now, so that they are touching each other (see picture), the stick figures can walk over the link and are at once just 1 cm apart. This unexpected abbreviation would be a miracle for them, because they can not imagine a 3-dimensional wave in their world (which is an abbreviation by another dimension and corresponds to a wormhole in our 3-dimensional universe). Now we know that we live in a three-dimensional world. The world is a sphere, a three-dimensional body. Everything that comes into our hand has length, width, and height. From this a volume can be calculated, which then has a certain weight. The three-dimensional world is infinitely richer and more complicated than the two-dimensional world. Even the atoms are so three-dimensional. There are substances, there are chemical compounds, there is temperature, there’s the force of gravity, there is a deformation when two three-dimensional bodies collide with each other, such as for example two cars at a traffic accident or two asteroids that collide. All this does not exist in a two-dimensional world. And if there were any living creatures, which live only in the second dimension like these stick figures, who can just go north, south, west or east, but not up and down, then these beings could hardly imagine all the things that can exist in the third dimension. This stick figure could build a ring of lines and 2-dimensional walls (red figure in the picture) around to hide in it. This would however be no hiding place for us, because we can watch from above on this hideout. Two-dimensional beings have no chance to hide from three-dimensional beings. But they think being unobserved. In reality we humans do mainly move in two dimensions. Only birds and fishes can also go upwards and downwards, if we except the elevator in the building. Our sensory organs are one-or two-dimensional: our eyes see a two-dimensional image on the curved surface of the ocular fundus. The retina which contains the photoreceptor cells in the eye background, is two-dimensional, if somewhat arched. Only by the fact that we experienced our environment with other senses, for example the sense of touch, we know that the world is three-dimensional. And just because we don’t have one but two eyes we can focus on a distant image by moving the axes of th eyes a little towards each other until the two images from right and left cover up themselves in the brain (visual cortex) and are sharp. And from the tension and position of the eye muscle we can then estimate how far the subject is and can in our brain form an idea of 3 dimensions. Our hearing is, as far as the spatial dimension is concerned, even just one-dimensional. We hear only whether something close up is louder or slightly quieter. The fact that we have two ears, we can unconsciously exploit the difference between left and right ear and therefore estimate which direction a sound comes from. That is only the processing in our brain makes the perception of noise two-dimensional. If we turn now to the head, maybe a bit up or down, then we can estimate in addition a third dimension, because the brain can perceive precisely the position of our cervical spine. Also with the sense of touch we can palpate surfaces (2-dimensional). We perceive the position of our own hand by seeing it at the same time. Blind people can derive the position of their hand from her shoulder and elbow position. Thus they form a three-dimensional concept by puting together all these impressions in their brain. Although our senses are so not more than two-dimensional, we have learned to move in the third dimension and to imagine a three-dimensional world. In the Middle Ages, when the earth was still considered a disc, one might have been able to calculate that the earth is in fact a sphere. One would have to stretch a vast triangle perhaps from very long tight cords, about 5 km. 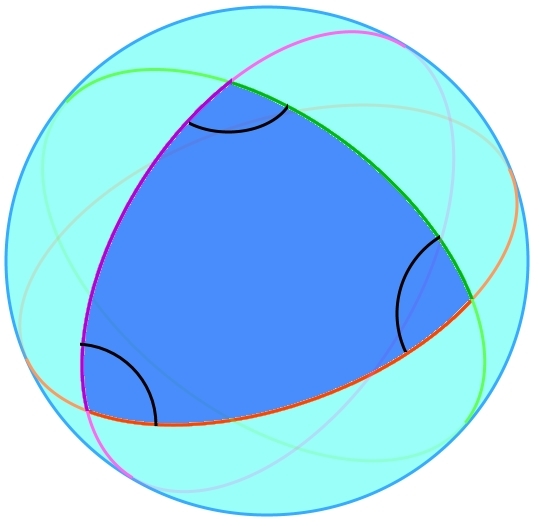 Then one could measure the angle in the triangle and counted together. But since the earth’s surface is already curved, one would not get 180 degrees like in a triangle in a smooth plain, but a little more. One could conclude that the Earth is no disc, but a sphere. In fact, already 200 years before the birth of Christ Erasthotenes has calculated the size of the Earth globe relatively precisely. He concluded this from the position of the sun at the time of the summer solstice in two different locations in Egypt. There were other Greek scientists, who assumed the form of a sphere for the Earth and got similar results. 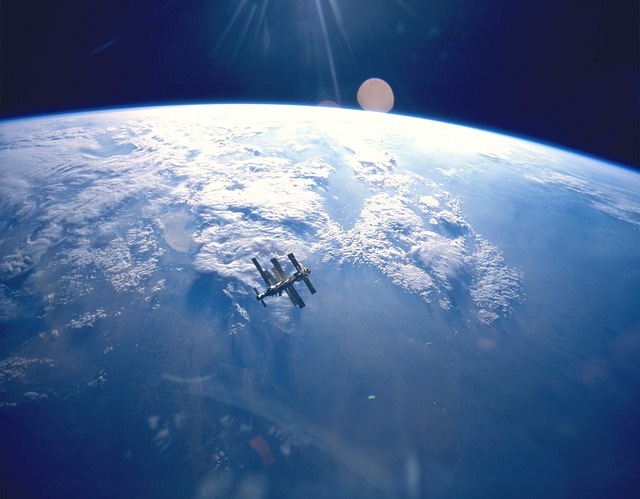 Only since the 1960s we can observe our own Earth from a space ship or satellite and we can pictorially see and confirm that the Earth is a sphere and that the Greeks were right. And what world seems more real to us? The 2-dimensional world on a sheet of paper or the 3-dimensional world in which we live? Here, everyone knows the answer immediately: our 3-dimensional world is the real one. The 2-dimensional world is only an image, it is a part of the 3-dimensional world. The 2-dimensional table top is a surface, part of the 3-dimensional table. And if I have been researching the 3-dimensional world and know it I can explain also the 2-dimensional world. But the stick figures in the 2-dimensional paper world think their world is real because they know no other. Now some thoughts about gravity. Have you ever wondered why an apple falls to the ground if you drop it at a height of 1m? Have you ever wondered why you don’t see a cord that pulls the apple to the ground? Or a spring that pushes the apple to the ground? Seen in this way it’s an amazing phenomenon! We can calculate it exactly, can say to the millisecond how long the Apple needs until it is on the ground. And we have learned as early as the first year of life as the toys were falling again out of your hand to deal with the gravity and have incorporated it into our lives. The gravity would be logical, if you tie a hammer on a rope like a hammer thrower and you circle it swiftly around. 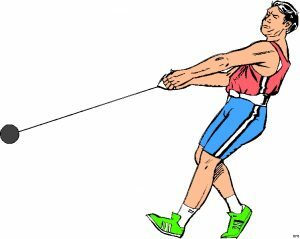 The rope then is the cause of the pulling force (centripetal force), and this works until you release the rope and the hammer flies its trajectory. But that exactly in the same way the planets revolve around the Sun, but without rope, this is yet a little magical, even if it happens always in the same way, and always to the same physical laws. The force of gravity, our story with the apple, is explained since Einstein’s theory of relativity this way: our 4 D universe – consisting of 3 spatial dimensions and 1 time dimension – is curved in a 5th dimension, and this creates the gravity. Viewed from the 5th dimension, the apple stays exactly on its space-time line. Only in our dimension the illusion is created that the apple starts to move by itself and falls to the ground.